Matt is an Australian teacher and game developer who has lived in Thailand since 1989. He has been a regular contributor to EnglishClub since 2002. His contributions include interactive vocabulary-related cloze, crossword and matching games and pronunciation-related homophone and rhyming games. He also contributes interactive grammar games and writes many of the entries on EnglishClub's vocabulary reference pages, including phrasal verbs, idioms, slang and collocations. His contributions also include the sports vocabulary section and This Week in History, and he played a major role in developing the Learning English Video Project. Matt was born in Melbourne, Australia, where he completed high school before studying music, film, art history and sociology at Monash and LaTrobe Universities. He was also involved in Melbourne's underground music and arts scene, contributing his keyboard and synthesizer skills to post-punk funk band Use No Hooks, one of many highly-innovative bands within the inner-city Little Band scene. 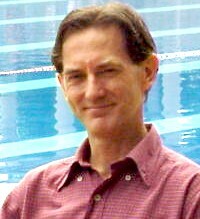 After moving to Sydney in the mid-1980s, Matt became interested in travelling and teaching English. After gaining TEFL qualifications, he spent two years exploring Asia before settling in Thailand and embarking on his teaching career. He soon realized that Thai people are very much into things being fun — whether it's work, learning a language, or whatever — and that games can be very effective teaching tools. 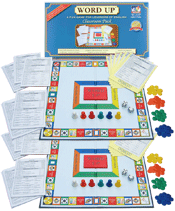 He began developing his own classroom games, and one of these was so popular that he decided to release it commercially. 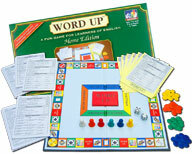 The first edition of his quiz-style board game Word Up was released in 1991, and within a few years it had become the world's best-selling ESL board game. He continued teaching in Thailand while marketing Word Up, and in 2002 met EnglishClub's founder Josef Essberger. They soon became friends and Matt has been a regular contributor to EnglishClub ever since. Matt's interests include reading, music, movies and sports. He still finds time to create ESL products and has published 1000 Phrasal Verbs in Context and Matt's ESL Games and Quizzes Book 1. For more on Matt's ESL products, as well as his free ESL games and quizzes, visit TEFLGames.com.